Asbestos is known to cause several harmful diseases; benign diseases, interstitial lung disease and malignant diseases such as lung cancer and mesothelima. The diseases are caused by exposure to asbestos dust and usually develop after a long period in people. The duration and degree of exposure increases the risk of contracting a disease caused by asbestos. Who is most at risk of asbestos related diseases? Asbestos has historically been used in hundreds of construction products found in buildings and steel related objects such as ships. Tradesmen such as builders, electricians, joiners, plumbers, painters and people who build gas boilers are most at risk of contracting a disease caused by asbestos, but the risk also extends to people who work in ship-building yards, railroad workers, asbestos miners and Navy veterans. In the UK asbestos was not discovered to be harmful until the early 1980´s. Over 2000 people die a year from asbestos related diseases compared to just 153 in 1968. In developing countries the use of asbestos is unregulated and asbestos-related diseases are increasing. Benign diseases are the least harmful effects caused by exposure to asbestos. They will often appear as pleural plaques along the surface of the diaphragm and adjacent to the sixth to ninth rib cages and in most cases causes chest pain and breathlessness. Between 20 and 60 per cent of people that have been exposed to asbestos will develop pleural plaques, but there is no risk are them becoming malignant. Pleural effusions generally occur within 15 years of asbestos exposure, but have been known to appear much later. If you find you are suffering from breathlessness and chest pain ask your doctor for a pleural biopsy to determine if there is a pleural effusion and if so whether it is benign or malignant. Asbestosis is an interstitial lung disease caused by inhalation of asbestos fibres and is a typical pneumoconiosis. It will not generally appear until after 20 to 30 years of exposure to asbestos and the degree of severity will be dependent on the length of exposure to inorganic dust. The systems are typically recognised by an onset of breathlessness which later develops by reduced fitness levels and will most often produce a cough or wheeze in the patient. Progression of asbestosis may lead to added complications such as bilateral aspiratory crackles, finger clubbing and cor pulmonale. 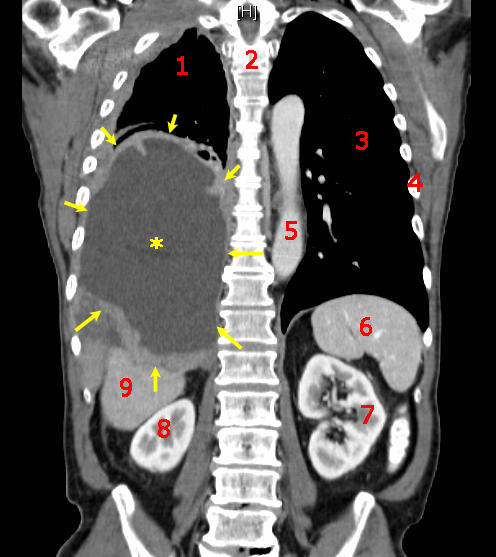 Asbestosis in patients is identified through a chest x-ray and a pulmonary function chest. If asbestosis is present there is evidence of reduced gas transfer, reduced lung volume, a restrictive ventilator defect and hypoxaemia in exercise related conditions such as climbing stairs or jogging. There is no cure for asbestosis and nothing can be given to a patient to treat it or slow down the effects of chronic obstructive pulmonary disease. Lung cancer is the second-most common type of malignant disease in the UK and is mostly caused by smoking and exposure to asbestos. A patient can developed lung cancer independently of cigarette smoking if they have has prolonged exposure to asbestos fibres. Lung cancer is generally diagnosed after a tumour has spread beyond the lung cell. By that time it is difficult to treat and the chances of survival are heavily reduced. However, if the lung disease is caught early enough there is a possibility it can be treated. The symptoms first occur with chest pain which is often accompanied by a chronic cough. In some cases the coughing will produce blood. Lung cancer has a latency period of at least 10 years, but research has shown it may not appear until around 22 years after exposure to asbestos. Therefore lung cancer is most commonly found in elderly people beyond 75 years old. Mesothelioma is a rare cancer caused exclusively by exposure to asbestos. There could be a latent period of anything between 20 and 50 years before it is diagnosed. Again, the symptoms are breathlessness, chest pains and chronic coughing and although significant progress has been made into the research of Mesothelioma no cure is currently available. Patients who are diagnosed with asbestos related diseases that were contracted at work may be entitled to compensation and should seek advice from Asbestos consultancy experts and government bodies. Image Credits: Pulmonary Pathology and Wikipedia.